Mr. Dearybury's Class Blog: Welcome Back! I hope you all had a fantastic holiday break! As always, it went by really quickly. But, I soaked up every moment I could with my family and friends and enjoyed every second! 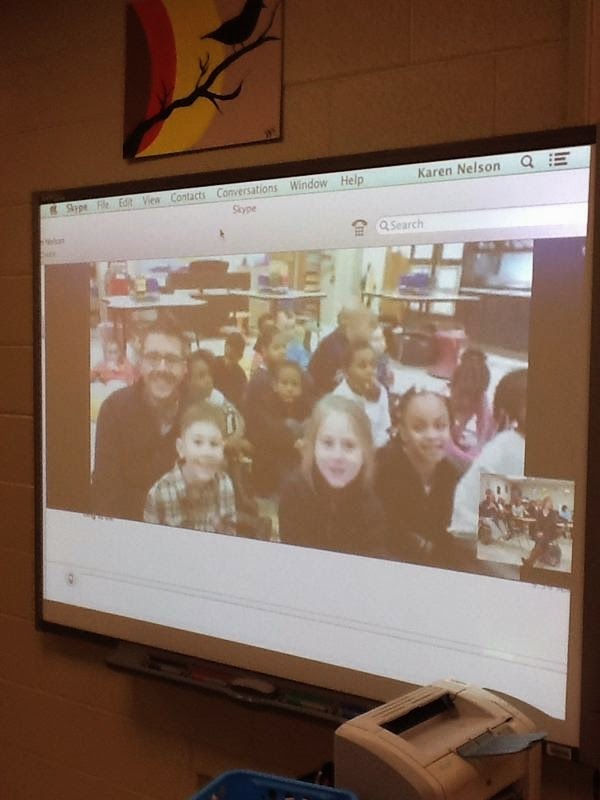 Today as the kids came back, we had the privilege of Skyping with a group of teachers from Alabama. They were wanting to see the way I teach a lesson via Skype. As my class often does, we decided to sing the lesson to them. The learned our 7 Continent song sung to the tune of "It's a Amall World" and our Frozen parody, "Do You Want to Read a Story?" The teachers loved it, and the kids did a fantastic job. Below is a pic of our class from the Alabama end of the Skype. They tweeted out the pic as soon as we were done. So glad my students have these kinds of unique opportunities.